If you are relatively knew to the world of knives and sharpening, jargon surrounding the various angles for a knife can end up being a little confusing. Especially when it comes to purchasing a knife sharpener – how do you know which sharpening angles are catered for? Which sharpener will better maintain the knives in your collection? If you are parting with a significant sum of money for an electric knife sharpener, you will want to make sure it will do the job you need it to do. And of course when buying knives in the first place, you will want to purchase the correct angled knife for the job you have in mind. This article attempts to explain all that and more. Here we are going to delve into all the different angled knives available, what their main uses are and what to bare in mind when it comes to sharpening such knives. Standard double-sided 20 degree bevel. 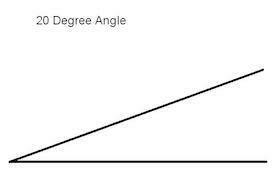 Knowing your angle is especially important when it comes to sharpening a knife. A 20 degree bevel will need to be placed against your sharpening stone at 20 degrees to get the best results. 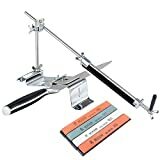 If using an electric sharpener, or a manual pull through sharpener, you will want to ensure that the angle guide can accommodate the type of knife you are using. 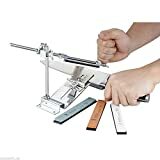 Likewise, you will want to ensure when sharpening a double bevel knife that your sharpener is working on both sides of the blade at the same time. (If it doesn’t, you will need to flip the knife so that each bevel is sharpened adequately enough). Asian Style Knives were traditionally single bevel. Of course, there are always exceptions to the rule. There are in fact cases when a knife only has a one sided bevel. Some Asian style knives fall into this category. What you will find here is that one side is sharpened to between 14 and 20 degrees, with the other being 0 degrees. If you have any Asian style knives it is best to check this before you carry out any maintenance. To cater for the American market, many Asian style knife manufacturers have begun to bevel both sides of the blade in keeping with the western approach. The average Asian style blade is actually sharpened to around 17 degrees. Again, if you have only a one sided bevel – DO NOT place that knife in an electric or manual pull through sharpener that sharpens both sides of a blade simultaneously. You will end up ruining your knife and sharpener. On many standard kitchen knives or hunting and sporting knives you can actually sharpen to a slightly different angle than the factory sharpening. However, when doing so you will need to consider the durability of the edge and the sharpness you wish to achieve. A lower angle will definitely give you a sharper edge, however durability will be compromised. Of course the purpose of the knife comes into play here. If you need something robust to use in the field, giving the blade a low angled edge will not be appropriate. Below we explain how the various angle choices can affect your knives, and which angle best suits a particular purpose. Clearly from what we have been discussing above, a low angle bevel is more suitable to cutting softer materials. The edge is just not strong enough to take much in the way of hard action. A razor blade is a good example of this. They are extremely sharp, (normally less than 10 degrees) but are designed only for the cutting of body hair. They have very delicate edges and would not be much good if used for any other purpose – the blade would damage very quickly indeed. A knife blade sharpened between 10 and 17 degrees is still very much on the delicate side. Extremely sharp yes, but not very durable. The fine sharp edge means that you cannot go about chopping firewood with a blade of this angle. In fact no real chopping motion can be used here, unless it is an Asian style knife designed for soft vegetables. Furthermore, a knife sharpened to this angle can slice soft meat such as raw chicken breast. When sharpening a knife with to a low angle, you do need to bare in mind the quality of the material used. Some harder steels are actually very brittle and cannot be sharpened to such a fine edge. They will damage very quickly. They will also be susceptible to impact, so would therefore need to be stored carefully. Leaving such knives rattling about your kitchen draw will shorten their life span considerably. Most standard kitchen knives fall into the 17 – 22 degree angle category. As we explained above, a favorite angle for the majority of Asian style knives is 17 degrees. Western style kitchen knives on the other hand normally come in at around 20 degrees. When sharpening your kitchen knives you do have a little bit of leeway with the angle you choose. 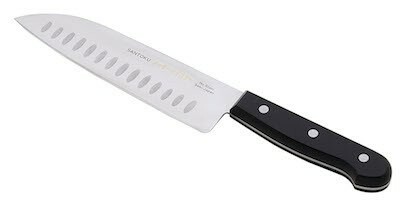 Most kitchen knives are built out of durable enough materials to be sharpened down between 15 – 20 degrees without any issue. You will not shorten their life span and they should hold up well. Of course, knowing the factory edge of your knives and keeping your sharpening angle in line with that remains the recommended approach. A total angle of 40 degrees is still on the weaker side when it comes to durability, which is why when it comes to sporting and hunting knives, you will find the angle of the edge that much wider. Now we are in the territory of knives used out in the field. When you are using a hunting or pocket knife, you will want it to withstand all sorts of force. You will only be chopping and slicing, but also sawing, grinding and using the edge as a screwdriver etc. In short you need something that is sharp enough, yet durable and versatile enough to handle all you have to throw at it. For this a sharpened angle of between 22 – 30 degrees is what you need. Finally, anything over 30 degrees is best left for knives such as axes, cleavers and machetes. A blade edge sharpened this wide is going to be very durable indeed. If you’re chopping down trees, you are obviously going to need that extra strength in your tool. You might also want specialized wood tool sharpeners to maintain those knives. However, the trade off is obviously sharpness. Chopping ability is reduced on a knife-edge of over 30 degrees. However, these knives still are still very efficient when used in a cutting action. Where as any other knife would damage easily under such abuse, an axe clearly can handle the job it is designed to do. And there you have it. An explanation of what knife angles are used for what purpose and what you should bare in mind next time you decide to sharpen your kitchen knives or tools. The more knowledge you have, the longer your knives will last you.